Fully-loaded with an award-winning feature set, Milwaukee's new 2-1/4 max hp electronic variable speed BodyGrip® Router offers the ultimate in router performance. Featuring an industry-first BodyGrip® design, a comfortable rubber grip wrapped around the router's base with an adjustable, custom-fit handstrap, and two over-molded side handles, comfort is in the palm of your hands. In addition, the router's wide, 6 in. base diameter and low center of gravity design provide a comfortable, well-balanced ride throughout the cut. Whether left or right-handed, the router's design minimizes muscle fatigue while maximizing cut control and comfort during operation. The new router is powered by a best-in-class, 13 amp, 2-1/4 max hp Milwaukee motor with electronic variable speed (10,000-24,000 rpm), premium motor feedback and soft-start technology. With 36 distinct speed settings, the user can precisely match the tool speed to the routing task at hand. The router's premium electronic motor feedback circuitry maintains optimal cutting speed and power throughout a cut, regardless of load conditions. Finally, the router features motor soft-start technology that quickly, steadily ramps the motor up in stages, thus reducing tool jerking and wear on the brushes and bearings. Precise routing ensures one-pass quality profiles. To this end, Milwaukee's new 5616-20 router features Milwaukee's industry-first linear depth adjustment system with above-the-table access. The ideal solution for both free-hand and table-mounted routing, this industry-exclusive system provides fast, accurate coarse adjustments to within 1/8 in. and micro-fine adjustments to within 1/64 in. Unlike helical systems, the motor doesn't spin as the cut depth is changed, ensuring that the motor controls and power cord remain in a constant, optimal position. This revolutionary system can be accessed from above a router table with the included T-handle wrench or any 3/8 in. hex socket wrench with extension and simplifies the once tedious adjustment process required with other models. 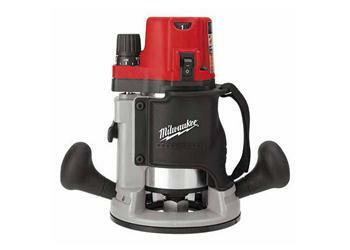 In addition, the new 2-1/4 max hp EVS BodyGrip® routers are built to last in the Milwaukee tradition. The router's circuit board is completely submerged in a protective, flexible compound that protects it from drop-shocks, vibration and damaging contamination. For added protection when table-mounted, the router also features an exclusive motor contamination shield that keeps damaging debris out without sacrificing airflow and a durable, rubber shield for dust-free access to the height adjustment system. Rounding out the defense is a heavy-duty, 22 amp switch, 100% sealed ball bearing motor construction, and a tough machined aluminum motor housing and base. Micro-fine linear depth adjustment to within 1/64 in.